Product prices and availability are accurate as of 2019-03-04 11:09:10 EST and are subject to change. Any price and availability information displayed on http://www.amazon.com/ at the time of purchase will apply to the purchase of this product. Featuring a classic scalloped back, with solid wood legs in a red brown finish, this beautiful sofa is an elegant addition to any living space. 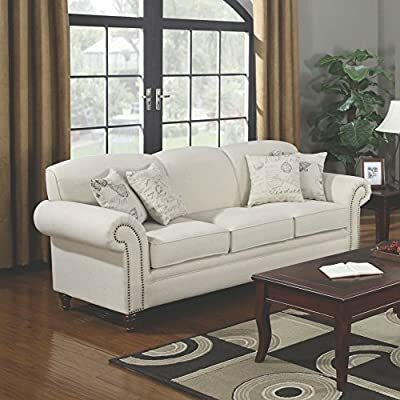 Nailhead trim accents the piece, offering a beautiful complement to the oatmeal upholstery. Plush rolled arms, pocket coil seating, and padded back offer comfort and style to your space. Accent pillows finish off this piece and come included in both French script and butterfly patterns.